With British police now underfunded, understaffed and wholly demoralized The Guilty shows what pressures they are up against. 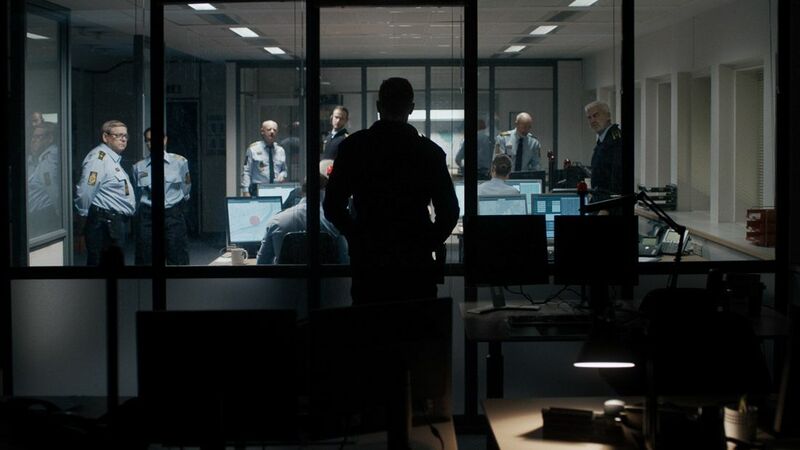 This however is a Danish film, though rather than playing it from an ‘on the streets’ perspective, The Guilty is shot entirely from the point of view of a police call handler in real time. It’s generally widely known that police have to deal with all manner of hopeless halfwits ringing up for the most ludicrous of reasons. Their pizza has been delivered late or the neighbour’s cat is trespassing on their lawn or that their child won’t hand over the TV remote control (all genuine 999 calls released by Brit cops to demonstrate just how much of their time is wasted by people incapable of living their lives without ringing the police). But as both comic and depressing as those real life calls are The Guilty focuses on Asger Holm (Jakob Cedergren) a cop who initially for unknown reasons has been confined to restricted duties and kept off the streets to take calls from the public. For the first ten minutes Asger is seen as a dedicated cop frustrated at being office bound but still doing his best until that one call comes in that changes everything. A woman apparently ringing to speak to her child until Asger realises that for some reason she can’t let on that she’s actually talking to the police and is in some sort of danger. It’s a great leaping off point and drags you straight into the drama putting you in the same position as Asger trying to find out what danger she is in, where she is and what can you do? Directed and co-written by Gustav Moller this is his first feature length film having only made a short film and a couple of TV episodes before and has taken the first time writers rule of scriptwriting to heart. Namely with little chance of getting a big budget he has concentrated the entire action into one small set, here it’s a police despatch control room, and put a great idea into it. As The Guilty peels back its layers it becomes clear that Asger’s own job is in danger for a different matter yet despite the job hanging him out to dry (something that Brit cops feel too) he still wants to help but adheres to the very reason why he joined the job and that is to help people in danger. Cedergren is shot in close up for most of this and it’s an actors dream to have a film written solely around them and in many ways its similar to Tom Hardy’s film, ‘Locke’ which also unfolded across a number of phone calls and as the story progresses it’s clear that all is not right with the woman’s children too with the horror slowly spreading across his face as he realizes the worsening situation. From the moment the film story kicks in it never lets go with a compelling second act prompting audiences to wonder what they would do in the same situation and what Asger can do stuck in his control room trying to get units to assist. If comes apart a little towards the end and there are loop holes which police procedure would not permit when the circumstances become more apparent but it’s been a great ride until then and this is the sort of film that first time writer / directors are urged to write if they want to get their scripts made. At times tense, sometimes harrowing, knowing that police do deal with things that the rest of us will never, if we’re lucky, have to deal with, this is a great little foreign language thriller arriving with a clutch of festival awards already. Don’t be guilty of letting the subtitles put you off, see it.